Yacht Nautitech 46 Fly named Daria II was produced in 2018. We propose her from marina Marmaris in region close to Marmaris. Daria II is certified for 12 pax. Layout of the vessel is 12. Nautitech 46 Fly Daria II has 4 cabins. For guests disposal there are 4 toilettes. You can fill the tank for fuel with 600.00 l l. and in water tank it goes even 600.00 l liters. With engine 2 x Volvo 50 hp Daria II can navigate really fast. Daria II is 13.71 m long and 7.54 m wide. Depth is 1.45 m. You can see more yachts clicking here: Catamarans Marmaris. Yacht's equipment includes : Air conditioning, generator, Inverter 12v-220v, Wc pump electrical, Bimini top, Anchor electric windlass, Dinghy, Autopilot, Plotter gps in cockpit, Mobile phone (netted). . Nonrefundable caution accounts for 2000.00 EUR. Choose our offer and have fun on the deck of Daria II. 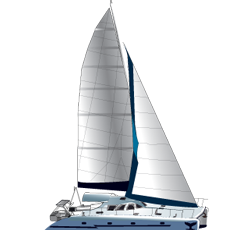 This Nautitech 46 Fly from Marmaris from Turkey Get more following this link: Catamarans Turkey.